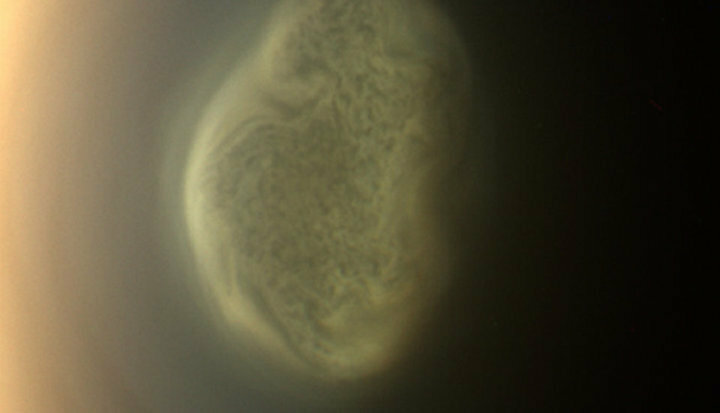 Observations from the Cassini mission revealed a rapid cooling of Titan’s southern hemisphere in 2012, which scientists say is unique in the solar system and brought about by the moon’s exotic atmospheric chemistry. Winter fell faster than expected in 2012 on Titan, the largest moon in Saturn's system. Astronomers now think that the moon's south pole cooled down quickly because of an increase in trace amounts of certain gases in the atmosphere. Scientists saw a hotspot suddenly cool in the planet’s southern hemisphere, creating a strong polar vortex. They also spotted hydrocarbon ice in a cloud at roughly 300 kilometers (186 miles) above the surface. Researchers studying the observations called the finding surprising because ice formation on Titan requires temperatures of about minus 234 degrees Fahrenheit (minus 148 degrees Celsius). That's substantially cooler than temperatures observed at similar altitudes and latitudes in 2011. The vortex took more than two years to enter a settled state and set off chain reactions through the rest of the planet’s atmosphere. Teanby is the lead author on a paper describing the conditions on Titan. The paper appears in the journal Nature Communications. Titan is the only known moon that has a thick atmosphere. The atmosphere on Titan is so thick that its orange-colored gases completely shroud the surface below. The atmosphere is 98 percent nitrogen, but several types of trace gases are present, such as hydrogen cyanide, acetylene, cyanoacetylene, and propylene. The new data comes from the Cassini spacecraft, which orbited Saturn's system for 13 years between 2004 and 2017. The probe made 127 Titan flybys and observed Saturn's system for almost half of the 29.5 years it takes the planet to orbit the sun. This long timespan allowed Cassini to compare winter in the moon’s northern hemisphere to winter in its southern hemisphere. Titan is unique in the solar system because cooling gases are produced through photochemical interactions high in the atmosphere, meaning the chemical reactions are triggered by exposure to the sun. "This does not happen on the other terrestrial planets — Earth, Venus, and Mars — as the major atmospheric cooler on those planets is [carbon dioxide]," the authors wrote. The gases on those planets are more uniformly mixed between latitudes. So changes in trace gases at the poles don't spur the same kinds of effects. While Cassini is no longer operational at Saturn, scientists saw the return of the hotspot in the south during the mission's last observations in 2016 and 2017. But the scientists say we will likely need to send another mission to Saturn's system to take a better look.